This article, one of the classic works about flageolets, was originally published in the second part of “The Harmonicon” in 1830 by Samuel Leight, 18 Strand, London (pg 499-500). Its author John Parry was one of the great flageolet-players in the early 19th and, as he reveals, had a significant rôle to play in the development of William Bainbridge’s double and triple flageolets. However lightly these little instruments may be thought of by many persons, the immortal Handel did not disdain to use them, and that too in the most conspicuous and effective manner. Nothing can be more like the singing of birds than the flageolet part in “Hush! ye pretty warbling Choir,” and “Oh ruddier than the Cheery.” Dr. Cooke’s beautiful glee of “Hark! the Lark at Heaven’s gate sings,” had also a very characteristic accompaniment for the flageolet*; and since quadrilles have become fashionable in this country, their votaries well know the value of the flageolet, which, in fact, is considered the principal instrument in the orchestra! The flageolet used to play Handel’s music is an English one, with seven holes in front and one at the back, the lowest note is, in written music, F♮ in the first space, but the actual pitch is an octave higher, and the compass two octaves, and the best keys C, F, and B♭; to produce all notes above G the back hole must be half stopped with the thumb of the left hand, which is inconvenient in rapid passages. The flageolet used in quadrille playing is a French one, having four holes in front and two at the back, with keys to produce the chromatic scale; the lowest note is A in the second space, (the actual pitch an octave higher,) and the compass about two octaves; the best keys, G, D, A, and E♮—but expert performers can play in any key almost; on this, as well as on the English flageolet, the upper back hole must be half stopped to produce the high notes. About thirty years ago, Mr. Bainbridge may great improvements on the Englsih flageolet, for which he took out a patent. By half closing the top hole in front with a piece of ebony, he did away with the pinching of the hole at the back, and he made his instruments on the same scale nearly as the German flute, which caused them to become very popular among both ladies and gentlemen. 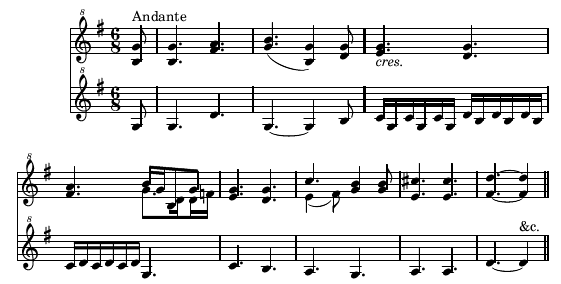 The tone too was greatly improved, and the compass from C♯ below the lines, to G in altissimo. The best keys are C, G, D, A, and F, and the best part of the instrument lies from D below the lines to D above. These flageolets are made of various sizes, so that music any be played in any key by changing the instrument, like the clarionet. In the year 1804, Mr. Parry fixed two of Bainbridge’s flageolets in a frame, and performed duets on them, and shortly afterwards he added a third, and played “Here’s a health to all good lasses,” in three distinct parts, at Covent Garden Theatre, for Blanchard’s benefit. Bainbridge made, from this, a double flageolet, out of one piece of wood, which answered tolerably well; but he invented a mode, with the assistance of keys, to fix two of his single flageolets together, or rather two bodies in one head, which became exceedingly fashionable; for music in two parts, from could be easily performed; and on the instruments made now with additional keys, &c. &c., such passages as the following may be played. The trio flageolet. Within these few years Mr. Bainbridge has added a bass joint to his double flageolet, the compass of which is from and the tone resembling the lower notes on the German flute. The effect produced by the combination of three notes is very good and mellifluous. The bass joint is fixed at the back of the double flageolet; and the breath is conveyed by means of a tube; and by the introduction of what are termed stop keys, a solo, duet, or trio, may be instantaneously performed. The following will give an idea of what this instrument is capable of performing. The bass notes are produced by keys, pressed with the thumb of the left hand. This instrument being purely English, I consider it deserving of being recorded, as a very ingenious invention.